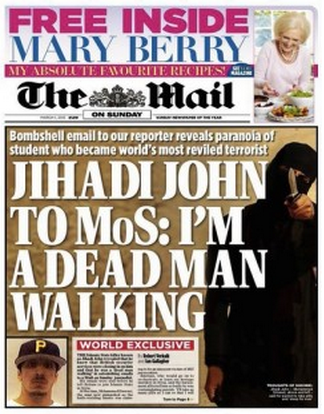 “JIHADI JOHN TO MoS: I’M A DEAD MAN WALKING” thundered the Mail On Sunday this morning, claiming to have a “World Exclusive”. However, and here we encounter a significantly sized however, the follow-up text in the online version suggests this may not be strictly accurate: “Jihadi John tells of paranoia at being shadowed by MI5 before he went to Syria in bombshell email to Mail On Sunday”. The problem for the MoS is that there have been so many totally untrue front page stories in recent memory, from “BBC TURNS ITS BACK ON YEAR OF OUR LORD” to “SIR CLIFF: I’LL SUE THE BBC”, that today’s example is bound to be subjected to the most rigorous examination. And that examination suggests that “Jihadi John” has not really told the MoS what they claim he told them. In order to show how this conclusion can be reached, let’s start at the very beginning - as it’s a very good place to start. “The Islamic State killer known as Jihadi John revealed that he knew British security services were closing in on him and that he was a ‘dead man walking’ in astonishing emails to a Mail on Sunday journalist” tells the article. But then comes the slightly difficult admission “His emails were sent before he left Britain to join Islamic State in Syria”. And how long before he left would that be? “Emwazi, who would go on to orchestrate at least six hostage murders in Syria, said the harassment affected him so badly he was contemplating suicide. ‘I’ll take as many pills as I can so that I will sleep for ever,’ he warned. His emails to Security Editor Robert Verkaik in December 2010 and 2011 offer a remarkable insight into his state of mind at a time when he was already deeply immersed in extremism. Some verge on the paranoid, with frequent complaints that his every move is being shadowed by intelligence officers”. Right. So we’re talking about communications made around four years ago. And the email used as the basis for the MoS headline came about as part of an exchange in which “he recounts what he suggests was a sinister encounter with an MI5 agent … Having advertised his laptop on classified adverts website Gumtree, he went to meet a prospective buyer at Maida Vale underground station near his West London home”. The buyer did not check out the laptop, which Mohammed Emwazi found strange, but he did know his full name, which had not been previously disclosed. This served only to stoke his paranoia, and hence the comment “Sometimes i feel like [I’m] a dead man walking”. Yes, the comment was made, but it was made well before Emwazi ventured to Syria, and, it seems, before the Syrian conflict even got going. It is only recently - like last year - that the ISIS (or whatever they’re called this week) beheadings began, and only from that point did the “Jihadi John” meme come about. So “Jihadi John” didn’t tell the MoS anything. “The man who would later go on to be nicknamed Jihadi John” would be the correct terminology. But that’s not sufficiently “Scary Muslims” to sell papers, so the facts have to be massaged to fit. At least it’s the same person, though. Which is actually an improvement for this paper.